Signed by the Atlanta Braves as a non-drafted free agent on July 2, 2010...Signed by Luis Ortiz...On Atlanta's disabled list (right knee bruise) from August 9 to September 5, 2017; included an injury rehabilitation assignment to the GCL Braves (R) and Gwinnett (AAA). Hit .272 (126-for-464) with 19 home runs and an .806 OPS in 134 games during in his first full season at the major league level ... Hit .339 (39-for-115) with a 1.023 OPS with runners in scoring position…His OPS in these situations ranked second in the National League among qualified hitters...Only Cincinnati's Joey Votto (1.028) was better ... His 19 home runs were the most by a Braves third baseman since Chipper Jones hit 22 in 2008 ... Began the season on the 10-day disabled list with a right oblique muscle strain…Missed 16 games from 3/29-4/18 ... 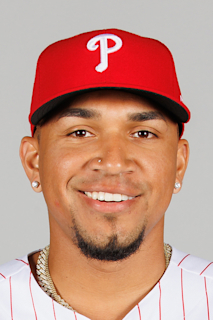 Returned to the lineup on 4/18 vs. PHI and struck out as a pinch hitter…His first three plate appearances of the season came in a pinch-hit role ... Went 3-for-5 for Triple-A Gwinnett on 4/18 to become the first player to play in both a minor league and major league game on the same day since Lane Adams did it for the Braves, 6/7/17…Adams pinch hit against the Phillies after starting the day with a 2-for-4 effort for Gwinnett ... After being named the starting third baseman on 5/20, he hit .279 (112-for-402) with 17 home runs in 110 games ... His 17 home runs over this stretch were the second most on the team, trailing only Ronald Acuña Jr.'s 22…His 10 gamewinning RBI in this stretch also tied for the team lead with Freddie Freeman ... Played primarily at third base (114 games, 105 starts)…Also appeared at shortstop (18 games, 15 starts) and second base (three games, two starts) ... A switch hitter, hit .273 (88-for-322) with 12 home runs and a .805 OPS from the left side and .268 (38-for-142) with seven home runs and a .808 OPS as a righty ... Hit a solo shot on 5/29 vs. NYM (off Gerson Baustista) in the bottom of the ninth for his first career game-ending home run…His shot gave the Braves a 7-6 win.Hit his first career grand slam on 6/19 at TOR off Jaime García ... Finished the game 4-for-5 with five RBI from the No. 9 spot...Since the RBI became an official stat in 1920, only three N.L. No. 9 hitters have had four hits and five RBI: Jack Scott (1926), Johnny Sain (1946) and Micah Owings (2007) ... Started all four games against LAD in the NLDS and went 0-for-15 with a walk and five strikeouts. In his sixth professional season, made his major league debut on 4/11 after being recalled from Triple-A Gwinnett earlier that day…Entered the game as a pinch-hitter in the seventh inning (strikeout, reached first base on a wild pitch)...Collected his first major league hit on 4/16 vs. SD with an eighth-inning, RBI-pinch single… Hit his first career home run, 7/9 off WSH's Matt Grace. ..Overall was with the MLB club on three separate occasions and played in a total of 82 games, including 59 starts between third base (30), short stop (23) and second base (6)...Finished the season ranked tied for second among major league rookies (minimum 200 at-bats) with a .299 (72-for-241) batting average...Collected 21 doubles, all of which came over his first 77 games with Atlanta…His 21 doubles were the most through a player's first 77 games in Atlanta franchise history...After 6/3, his final recall from the G-Braves, his 21 doubles were just nine off the National League lead, despite having 103 fewer at-bats than leader Odúbel Herrera. ..Hit .310 with 19 doubles across 64 games, 6/16 through the end of the season…Opened his MLB career hitting .226 (7-for-31) with a .250 on-base percentage in his first 18 games...Hit .295 (65-for-220) with a .330 on-base percentage, 19 doubles, two triples, four home runs and 27 runs scored in 60 starts (technically 59 starts, was scratched just prior to first pitch on 8/8 vs. PHI) with Atlanta...With Atlanta, batted .403 (29-for-72) with 10 doubles, three home runs and a .434 on-base percentage from the right side…Hit .254 (43-for-169) with 11 doubles and a .287 on-base percentage as a left-handed hitter... Primarily played two defensive positions while with Atlanta…Appeared in 43 games (30 starts) at third base, 26 games (23 starts) at shortstop…Also appeared in nine games (six starts) at second base and one game in left field... Produced a .980 fielding percentage with the major league club, committing just four errors in 198 total chances...Strung together four straight multi-hit contests, 6/17-20…Had a .643 (9-for-14) average during the run...Suffered a right knee bone bruise on 8/9 during pre-game warmups and was placed on the 10-day disabled list…Following three rehabilitation games, was activated off the disabled list on 9/5 and batted .321 (18-for-56, 4 2B, HR, 4 R, 8 RBI) over his final 18 games...Opened the season with Triple-A Gwinnett and was a part of their roster on three separate occasions (not including a two-game rehabilitation stint)…Overall, batted .311 (38-for-122) with nine doubles, four home runs, 20 RBI and 17 runs scored in 31 games in his AAA debut…Also played in two rehabilitation games with GWN, 9/3 and 9/4 (0-for-7)...Named by the organization as Gwinnett's Player of the Month for May after posting a .337 (30-for-89) average with two homers and 14 RBI. Spent his first full season at the Double-A level in 2016 playing in 126 games, including 124 starts for the Mississippi Braves…Batted .267 (119-for-446) with a career-high 26 doubles, a career-high four home runs and 43 RBI…Had 36 total extra-base hits... Ranked second on the M-Braves in games (126), at-bats (446), hits (119) and doubles (26), third in triples (six) and batting average (tied, .267), and fourth in RBI (43) and runs (46)...His 26 doubles also ranked seventh among Atlanta farmhands...Split time at second base, shortstop and third base, making 124 total starts…Made the most starts at second base with 64, followed by 31 starts at shortstop and 29 starts at third base…Posted a .971 fielding percentage (15 errors in 509 total chances) among the three positions...Batted .354 (34-for-96) in 27 games in July, with 14 runs, nine doubles, three triples and 14 RBI...Compiled a .320 (24-for-75) average against left-handed pitchers, while hitting .256 (95-for-371) versus righties...Closed the season by hitting .291 (65-for-223) in 62 games after the All-Star break, with 24 of his 36 extra-base hits on the season...Batted .315 (58-for-184) with runners on base, including a .296 (32-for-108) mark with runners in scoring position...Had his contract selected and was added to the 40-man roster on 11/18...Ranked by Baseball America as Atlanta's No. 27 prospect entering 2016, and as the "Best Defensive Infielder" in the farm system. Inbox: Will Wright open season with Braves? April 18, 2018 Atlanta Braves activated 3B Johan Camargo from the 10-day injured list. April 9, 2018 Atlanta Braves sent 3B Johan Camargo on a rehab assignment to Gwinnett Stripers. April 5, 2018 Atlanta Braves sent 3B Johan Camargo on a rehab assignment to Florida Fire Frogs. March 29, 2018 Atlanta Braves placed 3B Johan Camargo on the 10-day disabled list retroactive to March 26, 2018. Right oblique muscle strain. September 5, 2017 Atlanta Braves activated 3B Johan Camargo from the 10-day disabled list. September 3, 2017 Atlanta Braves sent 3B Johan Camargo on a rehab assignment to Gwinnett Braves. September 1, 2017 Atlanta Braves sent 3B Johan Camargo on a rehab assignment to GCL Braves. June 2, 2017 Atlanta Braves recalled 2B Johan Camargo from Gwinnett Braves. May 21, 2017 Atlanta Braves optioned 2B Johan Camargo to Gwinnett Braves. May 17, 2017 Atlanta Braves recalled Johan Camargo from Gwinnett Braves. April 20, 2017 Atlanta Braves optioned 2B Johan Camargo to Gwinnett Braves. April 11, 2017 Atlanta Braves recalled Johan Camargo from Gwinnett Braves. March 16, 2017 Atlanta Braves optioned 2B Johan Camargo to Gwinnett Braves. November 21, 2016 2B Johan Camargo assigned to Aguilas Cibaenas. November 18, 2016 Atlanta Braves selected the contract of Johan Camargo from Mississippi Braves. April 4, 2016 2B Johan Camargo assigned to Mississippi Braves from Carolina Mudcats. March 11, 2016 SS Johan Camargo assigned to Atlanta Braves. February 3, 2015 Atlanta Braves invited non-roster SS Johan Camargo to spring training. August 15, 2014 Johan Camargo assigned to Lynchburg Hillcats from Rome Braves. March 31, 2014 SS Johan Camargo assigned to Rome Braves from Danville Braves. May 31, 2013 SS Johan Camargo assigned to Danville Braves from DSL Braves. September 22, 2011 Johan Camargo roster status changed by DSL Braves. May 28, 2011 2B Johan Camargo assigned to DSL Braves. July 2, 2010 Atlanta Braves signed free agent 2B Johan Camargo to a minor league contract.